Fitness Equipment Source / Elliptical Trainer Buyer’s Guide / Front vs Rear Drive Ellipticals – Which is Better?! Find ways to work around the rear drive patent. Pay Precor for the use of their patented design, like NordicTrack did. Build a completely different design that did not infringe on the patent, thus came the front drive elliptical. Note: In our experience, if you’re considering a Rear Drive Elliptical then you should check out what NordicTrack has to offer. 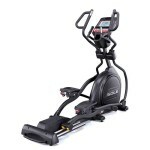 For Front Drive Ellipticals Sole Fitness is your best bet for a reasonably price high quality machine. 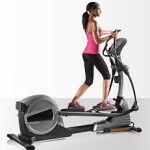 The elliptical stride on a rear drive machine has a feeling like you are jogging or walking. When you’re working out you also tend to be better centered on rear wheel drive ellipticals compared to a front drive machine. A front drive may seem more like working out on a stair climber. It’s also been noted that you tend to lean forward when working out on front drive elliptical compared to a rear drive. It’s also important to note that front drive ellipticals are easier to get on and off of because you don’t have to step over as much machine and you’re often lower to the ground. Which Provides a Better Workout? Some people suggest that you get a better workout front rear drive machines, but we haven’t found that to be the case at all. When you crank up the resistance of a front drive machine you can get you heart pounding the same as a rear drive elliptical. One of the advantages of rear drive ellipticals is you have less moving parts. Consequently, you have less parts that may require service. For example, most front drive ellipticals have foot pedals that run on rails in the rear, particularly with cheaper machines, the rollers may wear out with constant use. This is especially the case with front drive machines with single wheel rollers. You often find that the single rollers are less stable. However, front drive ellipticals like Sole, come with dual wheel rollers. They provide a more solid and stable feel. There are a number of newer elliptical types coming out that can be considered hybrids between ellipticals, stair steppers, and treadmills. For instance, the NordicTrack FS7i FreeStrider Trainer allows you to effortlessly adjusted your stride motion to target different lower body muscles. The NordicTrack ACT Commercial is another machine that doesn’t fit the front or rear drive categories. These machines are now considered Center Drive machines. The main advantage for this type of model is that they have a smaller footprint and can sometimes work better for smaller spaces. Stride Length — Depending on your height you want an elliptical that has a minimum 18″ stride length. For taller users you want a 20″ stride. Several machines have adjustable stride lengths that can accommodate users of different heights. You’ll find that cheap ellipticals tend to have more of a oval stride, rather than an elliptical stride. Smooth Motion — Cheaper machines have light flywheels, which result in a choppy motion. Opt for elliptical trainers that have around a 20 lb. flywheel or better. They’ll have a more natural feel to the motion and a better workout. Stability — Cheaper machines are lighter, which results in a lack of stability. There is nothing like having a machine rocking under you while you work out to make you never want to get back on it! The more you weigh the more important it is to get a solid heavy machine so it won’t move under you. There are two features that affect an elliptical’s stability. The design of the base and the weight of the machine. Overall Quality — Check out our Best Buys for top recommendations so you can get the best quality elliptical in your price range. When you do your research on a companies reputation be sure to look at both quality control and customer service. In conclusion, find a machine that feels best for you. Next: Programs and Consoles – What Tech Features Do You Really Need?